The skateboard is a toy in childhood popular with every boy. When it comes up in discussion amongst adults, it usually takes them back to their childhood. So even grow-ups still cherish a special feeling for skateboard. Robin and his friends also have a special feeling for skateboard which kept them company in their childhood. Recently, Moben Global Inc., a leading scooter-maker famous in the world, pushed out a cheap electric skateboard K1. K1 shares the same exterior look with the traditional skateboard. Having Head of this news, Robin told his friends and suggested to buy it. They moved swiftly to buy 4 sets online. Three days, 4 set electric skateboards arrived at their dormitory. 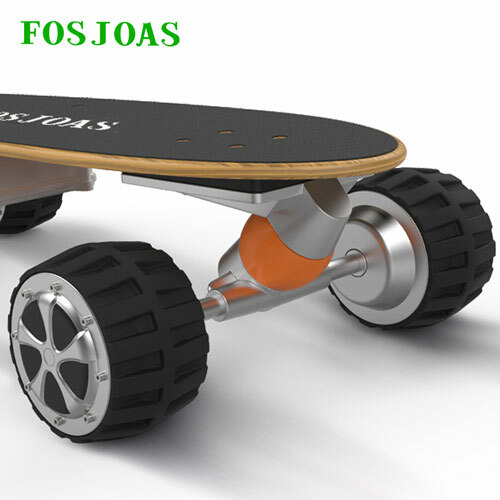 To put aside the features of the traditional, FOSJOAS K1 is powered by electricity. Robin and his friends took to this design. The traditional skateboard need go forward by human force. The rider has to push it by his leg. The long trip or long-time ride will exhaust the rider. This time, Robin and his friends did not feel tired at all. The electricity-powered electric scooter K1 can go forward without any push by leg. However long the trip is, they will not be fatigued any more. Therefore, they treated it not only an entertainment device but also a personal transport. Almost every skateboard-lover are energetic and a tastemaker who pursues the fashion and vogue. Robin and some of his friends are amongst this group of young men. They dislike the featureless thing. FOSJOAS realises the uniqueness of the young men and therefore provides them with a lot of colourful and stylish stickers that can be pasted onto the board of intelligent self-balancing scooters K1. Of these stickers, there are many theme, like X-men and Spider man. Through these stickers of one or another sort, Robin and his friends change the favour of their skateboards frequently, creating a novel air and giving a fresh impression to the passers-by. They enjoy the feeling of being spotlight.